Background: The Pacific Treefrog (aka Pacific chorus frog) is the most common frog in the Pacific Northwest. This species has been the subject of taxonomic debate. 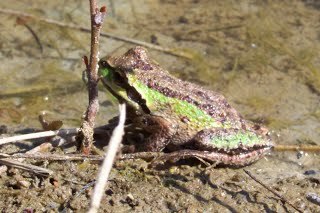 Until recently it was placed in the genus Hyla (Treefrogs), but recent research has indicated that is more properly placed in the genus Pseudacris (Chorus Frogs). Adult and Juvenile Description: This species has a distinct dark mask extending from the nostrils to the shoulder. They have relatively long slender legs with toes tipped with round toe pads and little webbing between the toes. The skin is smooth and they occur in a variety of colors ranging from green, brown, bronze, gray to the rare blue individual. Most have a Y-shaped figure between the eyes and irregular dark stripes or blotches on the back. The belly and chest are white and rough textured. The skin on the males throat is dark and wrinkled. Both males and females may reach up to 2 inches in length. Larval Description: The upper body and tail are typically brown in color. It is the only species in our region that has a tadpole with the eyes located on the outer margin of the head when viewed from above. They may reach up to almost two inches in length. Egg Description: Breeding begins as early as February and may last into June in a wet year in lowland habitats. Breeding at higher elevations my not begin until June or July. The breeding season is detectable by the loud chorus of males. Male congregate in large numbers and the choruses can be heard for long distances. Chorus activities is most pronounced at night, but also occurs during daylight. Lone males also make a kreck-et sound throughout the winter. Habitat: Outside of the breeding season, they can be found in a variety of habitats often quite far from water. Woodlands, meadows, pastures, forests and even urban sites can provide suitable habitat. Breeding sites can also be in a variety of sites ranging fro shallow vegetated wet meadows, forested swamps, shrubby flooded thickets and even stormponds and mud puddles. 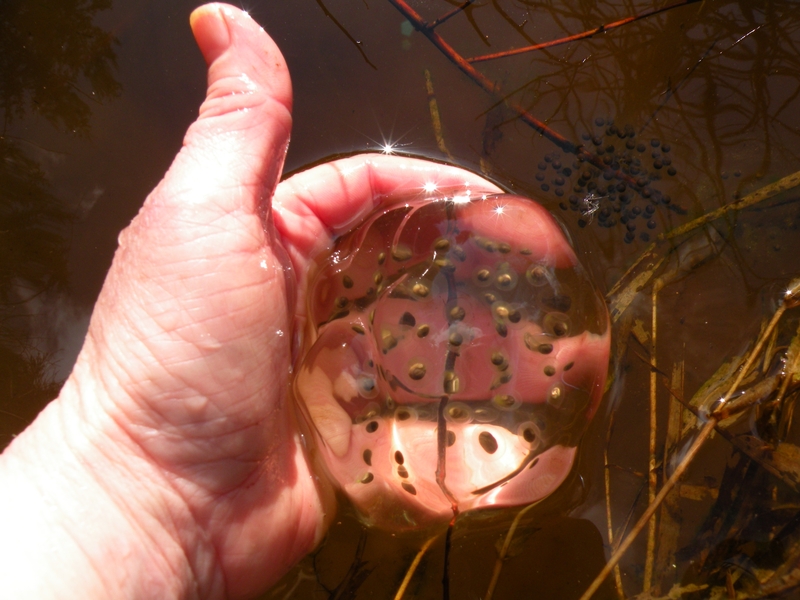 They are one of the few amphibian species in our region that can utilize very ephemeral pools for breeding. This allows them to avoid predation from fish and other amphibians that require permanent water. Locations in Whatcom County:common throughout the County except at high elevations.